Gangster boss Callard appears to be slipping out of Murphy's grasp, so he has to act fast. Murphy is on hand to crack a drugs gang when events suddenly spiral out of control. Their cover compromised, Murphy and Cole pursue new leads the search for the missing Goodall. Atwood waits for the other shoe to drop. Medical drama series about brilliant neurosurgeon Gabriel Monroe. I've only recently watched all five series of Murphy's Law - series 1 started off well but soon became mediocre. Series 2 was better but still not brilliant. All that was to change with series 3 when it all became much darker, grittier and with far superior story lines and scripts. Don't get me wrong, series 1 and 2 are still worth watching, but they are very inferior to series 3, 4 and 5. 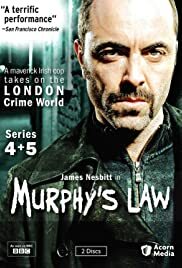 James Nesbitt is utterly superb in the role of Murphy - he's totally believable and never lets the viewer down. Fantastic. If I was only marking series 3 to 5 then I'd give this a 10/10, but it's only fair to judge all five series so far, in which case I reluctantly knock off one mark, so it's 9/10 overall. And if you want to see James Nesbitt in another excellent series, do give 'Jekyll' a go. It too is fantastic.